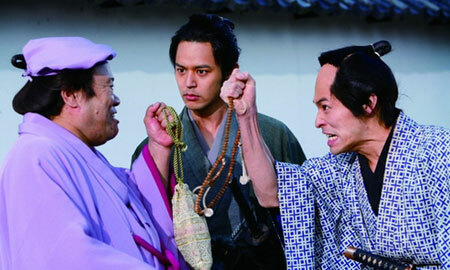 From left to right: Toshiyuki Nishida, Satoshi Tsumabuki and Ryota Sato in The Haunted Samurai. The Skinny: A supernatural period comedy that inspires more chuckles than laughs, The Haunted Samurai suffers from a cultural barrier, with an obsession with the samurai world that may not be that accessible. However, those who know their Japanese history will do just fine. Kevin Ma: Despite making the most money in Asia, Japanese films have some of the least overseas-friendly films. Some of Japan's biggest blockbusters are based on television dramas that are never shown outside of Japan, and local humor can often be difficult to translate, especially when it's in a period film. Based on the 2005 novel by popular novelist Jiro Asada, The Haunted Samurai is such a film. In one of his most mature roles yet, the hunky Satoshi Tsumabuki plays Hikoshiro, a low-level, down-on-his-luck samurai in 1867 Edo (now better known as Tokyo). Hikoshiro is unemployed after getting fired from his employer/father-in-law's house, and he gets no respect as the hardworking second son while his employed older brother gets by with his latent laziness. Alos, Hikoshiro's old friend just returned from overseas boasting the newfound success that he supposedly got from praying to the gods at a shrine in a nearby town. After a night of heavy drinking to undo his shame, Hikoshiro happens upon a shrine that appears to have the same name as the one his friend prayed at. Believing that it's the same shrine, he gives a half-hearted prayer for help. To Hikoshiro's surprise, a god does show up the next day to meet him. Unfortunately, the god happens to be the God of Poverty, and he's very good at doing his job. Within a day, Hikoshiro's family is already beneath a heavy debt that can only be paid off if they sell their family status. Thanks to an old subordinate, Hikoshiro finds out that he can get rid of one god if the curse is moved to another person. However, he soon discovers that while getting rid of one god may be easy, getting rid of three is a little harder than he imagines. Even though the basic structure of the film - a snowball effect of superstition and accident that can lead to a man's downfall - is fairly universal, Asada and director Yasuo Furuhata's world of samurai, shogun, and retainers is not so easy to understand. This is partly due to Asada's background. Claiming to be the descendent of a samurai who belonged to the Tokugawa shogunate, Asada even felt the need to fill a supernatural comedy with references to the world of samurai that would satisfy anyone who spent hours and hours watching period dramas on Japanese daytime TV. For those who don't understand a retainer's relationship to a shogun or know what a shadow warrior is, they'll still get two-thirds of an amusing supernatural comedy. Furuhata, with co-writers Toshimi Kokubo and Yasufumi Tsuchiya, come up with a very clear three-act structure with lots of comedic potential - when one god is gone, a worse one comes to bring more devastation, forcing Hikoshiro to find another way out. They also have a fairly likable and sympathetic lead character in Tsumabuki's Hikoshiro, a hardworking loser who, unlike some of the people around him, doesn't really deserve what he gets. Seeing how he fends off the curses and how those around him get their comeuppance is the source of the fun in The Haunted Samurai. However, the problem is that the film isn't very funny or all that much fun. Much of the humor in the story comes from the plot turns, and they only result in slight chuckles. This may be because of the cultural and language barriers, as the film is clearly aimed for local audiences who know their history (Only the English subtitles provide the exact year the film takes place in). On the other hand, the lack of comedy in the film may also be due to the story itself, which takes a clear thematic shift in the third act. Instead of learning about the dangers of superstition, Hikoshiro instead learns about the honorable duty of a samurai during the waning days of the shogunate. Even though the story follows in line with history (and Asada's own interest), the abrupt shift comes at the price of putting too much history into a film that doesn't exactly need it.